As we celebrate the Baptism of the Lord I thought it would be interesting to see two separate and theologically different expressions of this event from the early years of the Church. Declared a heresy at the Council of Nicaea in 325, Arianism is the view that Christ, while divine, was created by the Father and is therefore inferior to him. The orthodox view holds that Christ is equally divine (“of the same substance”) as God the Father. 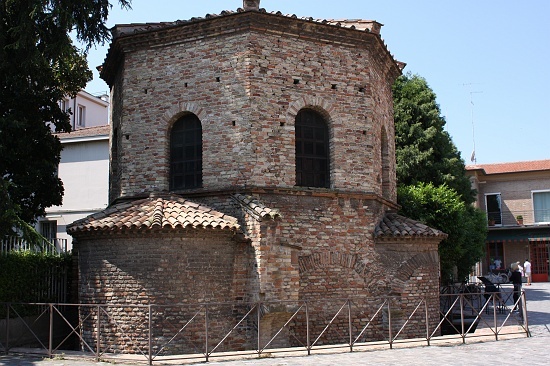 Theodoric built a new Arian cathedral (the Basilica Spirito Santo) with its own baptistery towards the end of the 5th century, not long after Ravenna’s Orthodox Baptistery was built. It is quite similar to its orthodox predecessor, including the mosaic in the dome. olive branch in its beak , alluding to the return of peace after the flood). To the right there is the figure of a noble and mighty old with white hair and beard, represented with naked torso and the lower part of the body covered with a green cloth. 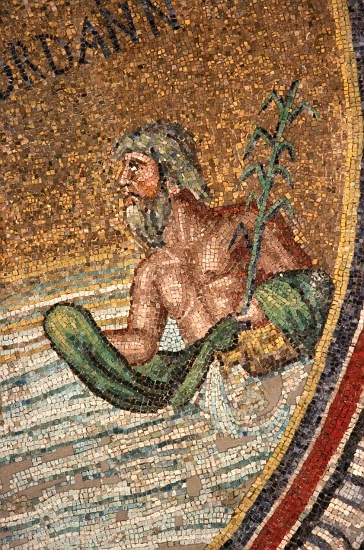 The character symbolizes the Jordan River, as provided for attributes that are derived directly from the river gods personified common Hellenistic iconography. In fact, the figure leans against a spilled jar, from whose mouth flows the water, and holding in his hand a reed marsh, while on his head sprouting red claws of a crab, which represent the elements of aquatic life. The Neonian Baptisery (Battistero Neoniano, also known as the Battistero Ortodosso or Orthodox Baptistery) is an octagonal baptistery built in the 5th century. 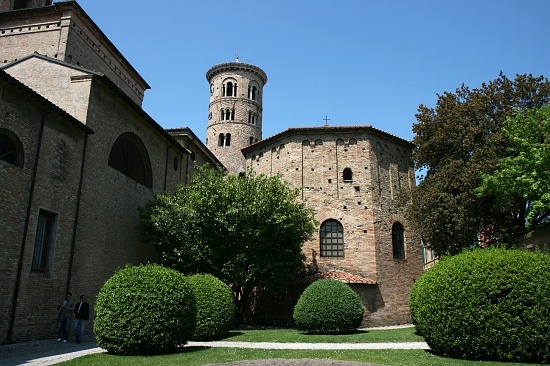 It is the oldest monument in Ravenna and contains some of the city’s most beautiful Byzantine mosaics. For a thorough theological, historical and liturgical understanding of the Neonian Baptistry I would recommend Annabel Jane Wharton’s study in the Art Bulletin of September, 1987 with its accompanying bibliography. The building was finished by Bishop Neone (451-75) in the second half of the 5th century, during which the mosaics were added to the dome. It is from this bishop that the Battistero Neoniano gets its name. 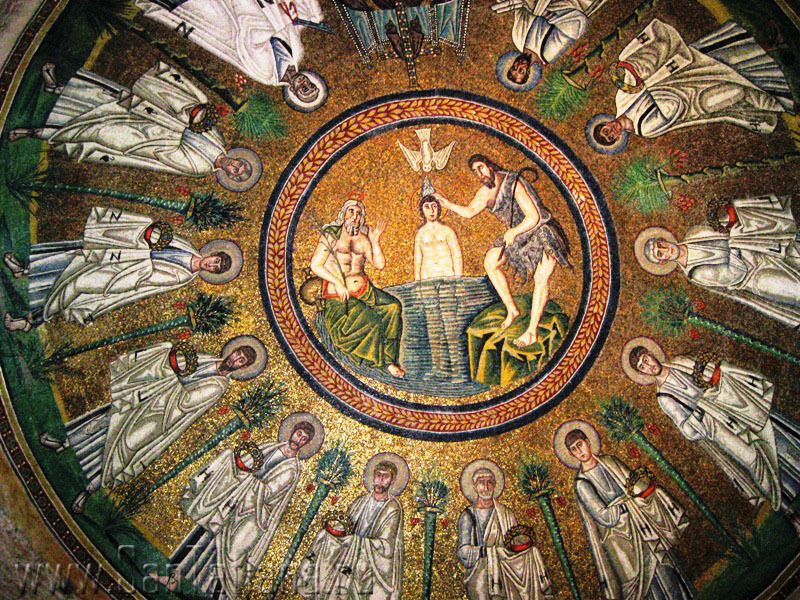 Dome mosaic (451-75) centering on the Baptism of Christ. In the center of the baptistery’s cupola is a magnificent mosaic laid out in concentric circles like a great wheel. 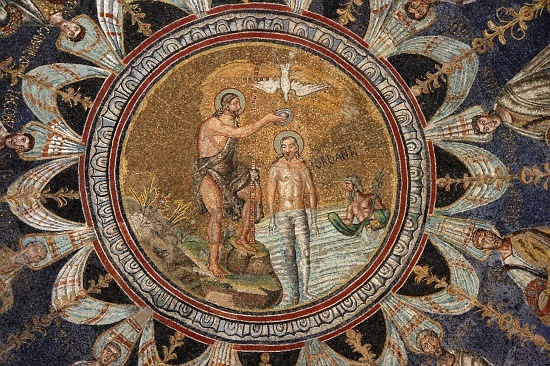 The central medallion depicts the Baptism of Christ by John the Baptist in the River Jordan. The right arm of John the Baptist, the dove, and Christ’s head are all 18th century restorations. The dish that St. John is using to pour the water was added in the 19th century by a Roman artisan named Felice Kibel, who was charged with restoring the mosaics and went overboard with creative license. 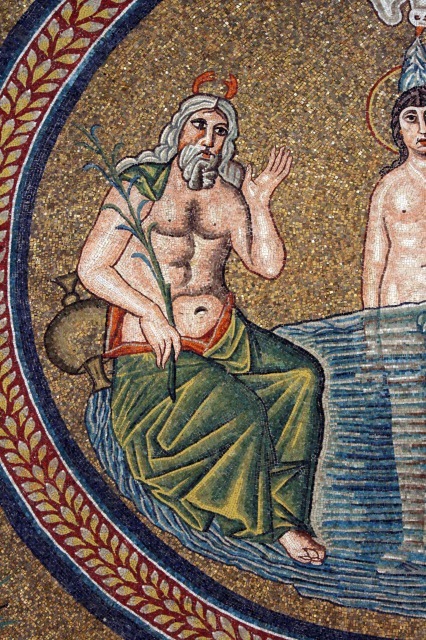 The lower right of the central baptism scene is a personification of the Jordan River as an old man rising from the water, holding a reed in one hand and offering a garment to Christ in the other. In comparing the two center scenes of the Baptism we notice a difference. In the Arian mosaic Jesus appears as a clean shaven youth, but in the orthodox depiction he is older and sporting a beard. Is there a significant reason for the difference? The youthful, clean shaven Christ was actually the first to appear in Christian art. The older, bearded Jesus began to appear only in the last part of the 4th century when, in an attempt to win over pagans, Christian artists began to depict Christ as divine as the pagan gods were divine, using pagan iconography that pagan citizens would recognize. The divinity of Jupiter (Zeus) and other supreme ‘father’ gods was usually indicated in pagan art by mature gods, appearing wise with full heads of hair and full beards. Some art historians, however, argue that the difference between the two images of Christ in the Ravenna mosaics was actually the result of the Christological challenge posed by Arianism. 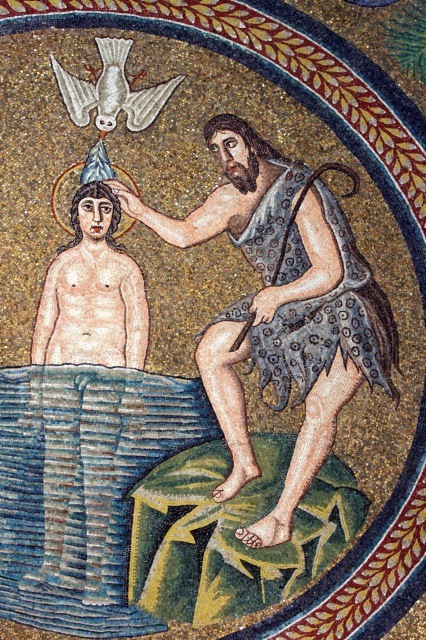 As the Arians believed Christ to be created by the Father and not co-eternal with the Father, he was depicted as young –or “inferior”—in the Arian baptistery mosaic. The Arian structure, remember, was built after the orthodox one and so, perhaps, the Christ in its dome was meant as a challenge to the Christology evident in the orthodox baptistery across town. Whether that was the case or not the possible difference in meaning might prompt us, on this Feast of the Baptism of the Lord, to consider the words from heaven, “This is my beloved Son…”,4 spoken as Jesus came up out of the water after being baptized by John. This entry was posted in Arianism, Faith, Jesus, John The Baptist, Mosaics, Symbolism. Bookmark the permalink.